While we started in 2009 as a humble auction site serving only a handful of customers a day, we’re very proud to have built QuiBids into an award-winning online service, one that thousands of people all over the world utilize for their shopping needs every single day. It’s very humbling for us to receive awards because they take us back to the early goings, when QuiBids was just a handful of employees working around the clock to build a company infrastructure while also hosting auctions and ensuring the delivery of customers’ won products. Luckily our QuiBids forebears built a pretty darn good infrastructure, developed solid site functionalities (like the Buy Now!) and smoothed out a good-looking interface (that recently got a major facelift!). All that hard work got publicly rewarded last week by the Interactive Media Council, whose annual Interactive Media Awards have recognized excellence in web design and development since their inauguration in 2007. 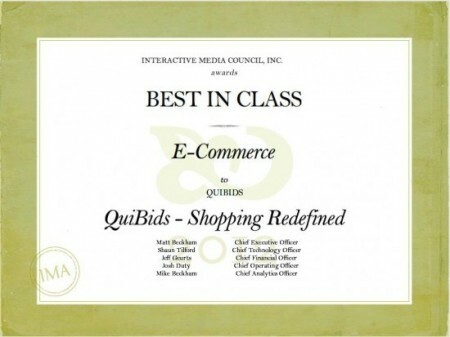 QuiBids scored a 481 out of 500 on their criteria (which judges a website’s design, content, feature functionality, usability, and standards compliance and cross-browser compatibility), qualifying us as Best in Class in the E-Commerce category! Think of that as scoring a 96% on a test back when you were in school! Obviously, we’re stoked — and feel super-honored! The Interactive Media Council aren’t alone in honoring QuiBids lately. okcBIZ magazine recently named us the third-best small company to work for in Oklahoma (after naming us fourth-best in the same category last year!). The American Business Awards (AKA The Stevies) announced that we’re a finalist for Fast-Growing Tech Company, and we also recently claimed the title of one of Oklahoma’s Innovators of the Year from the Oklahoma City Journal-Record newspaper. As you can tell, it’s been a great season for QuiBids! We want to take the opportunities we receive to thank our loyal customer base —you guys!— for returning to QuiBids for your shopping needs. We promise to continue to provide the most entertaining and engaging shopping experience on the web!